Moderate to severe forms of acne can leave permanent scars. Various laser energy devices can be used to remove scars and induce skin remodeling. In the hands of an experienced provider, this procedure is quite effective and relatively safe. Strictly speaking, acne is not a physically disabling disease—but that doesn’t mean it’s a harmless affliction. The psychological effects associated with acne can leave a deep and sometimes profound impact on self-esteem, confidence, and social life. Acne affects nearly all young people to some extent, with approximately 20% of adolescents suffering moderate to severe acne, which can leave permanent scars. In this article, we will be investigating a relatively novel treatment approach called laser resurfacing. In order to understand the treatment, you need to know a little about the condition itself. Excess keratin (a fibrous substance) and sebum production can plug the ducts which are connected to the glands. The plugged ducts may become colonized by a bacterium called C acnes (formerly known as P acnes). C acnes produces chemical substances that promote inflammation. The combination of the above steps causes the characteristic acne skin lesions to appear. Your body attempts to repair the damage by making new collagen connective tissue. Acne scarring occurs due to an abnormal healing process. There are many different kinds of acne scars; being able to identify them is important as it can guide the choice of treatment. Boxcar scars, which are similar to ice pick scars but deeper and more defined. Rolling scars are also depressed but have rolled edges. Atrophic scars are depressed areas with very little collagen production. Scars may be associated with areas of skin discoloration, termed hyperpigmentation. Most people have more than one type of scar at the same time. LASER is an acronym for Light Amplification by Stimulated Emission of Radiation—that is, an intense focused pulse of radiation. Different types of lasers, including those used in acne scar treatment, differ in their energy and wavelengths. Laser energy has a heating effect on the tissue that absorbs it. Depending on a series of complex factors, this can have various effects on the target cells; from stimulating their activity to causing their death. Broadly speaking, lasers used in skin treatment are classified into ablative, nonablative, and fractional lasers. 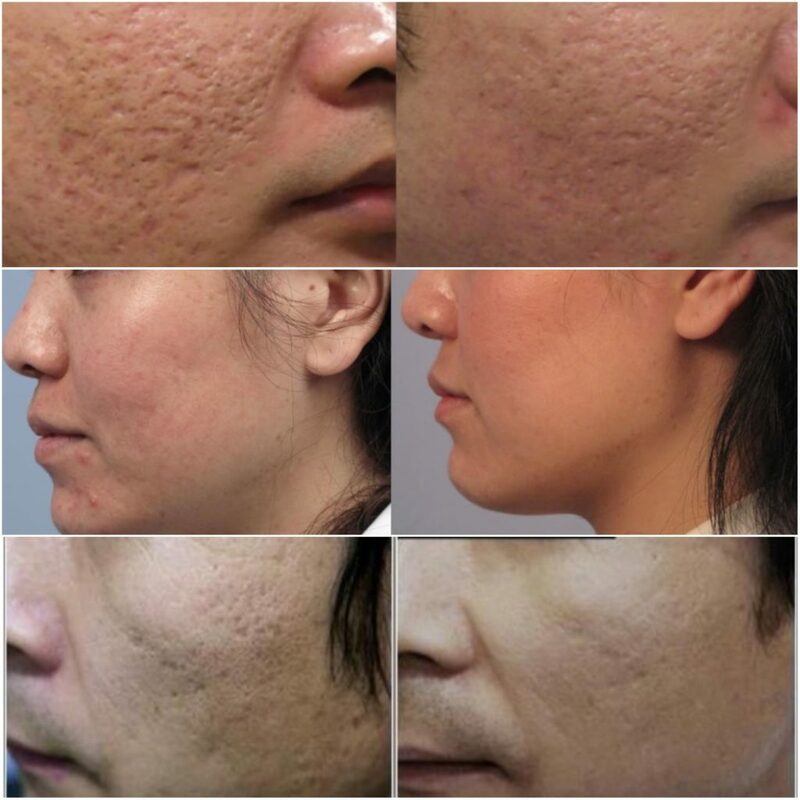 Ablative lasers work by vaporizing or removing thin slices of the skin at the scarred areas. These lasers target both the epidermis (superficial skin layer) and the dermis (deep skin layer). The most common types of ablative lasers are CO2 (carbon dioxide) and erbium:YAG lasers. Er:YAG is generally considered less effective than CO2, but associated with a lower risk of side effects. “CO2 lasers are frequently used for scarring to create thermal areas of injury to rejuvenate collagen,” says Dr. Klein. CO2 lasers are good for high-grade atrophic and hypertrophic scars, while Er:YAG is best for mild to moderate scarring. CO2 is also used for pigmented lesions and erbium for deep tissue scarring. These lasers target only the dermis (deep layer of the skin) and do not vaporize scar tissue, but rather induce remodeling of connective tissue. Nonablative lasers are not as effective as ablative lasers but they have the benefit of a much better safety profile, which makes them quite popular. Nonablative lasers include infrared, pulsed dye laser (PDL), and intense pulsed light (IPL). Nonablative lasers rely on the principle of inducing a controlled injury to collagen in the dermis, which promotes the healing and remodeling process. Scientists believe this process happens through stimulation of fibroblasts, which are collagen-producing skin cells. New collagen production in a more normal configuration causes tightening of the skin and an improvement in the appearance of scars. Nonablative lasers are good for treating red or pigmented scars, as well as mild hypertrophic scars and keloids. Fractional lasers are considered an intermediate between ablative and nonablative lasers. The delivery method of this laser relies on the precise administration of thousands of tiny laser beams to a small area, which makes it super localized. Treatment areas are called microthermal treatment zones (MTZs). Fractional lasers penetrate both the epidermis and dermis. Laser energy is absorbed by skin cells, including melanocytes (pigment-producing cells) and collagen. This induces remodeling in the MTZs while leaving the surrounding areas intact, speeding up recovery. Before and after laser acne and multi-level scar treatments. Credits: Dr. R. S. Mulholland. This is an outpatient procedure that is performed with a numbing cream or gel. Ablative laser treatment is a little more painful so it may require a local anesthetic injection and an oral medication to help you relax. The appointment with your dermatologist should last between one and four hours, including prep time. The actual time exposed to the laser is much shorter, and you will be asked to remain still while it is active. After the treatment, your physician should instruct you on careful skin care routines to follow in the coming weeks to months. This will include avoiding sun exposure, using sunblock with an SPF of 30 or more, and possibly using antibiotics to avoid infection. “In general, you don’t want to have a tan or plan to be in the sun in the couple of weeks following treatment,” says Dr. Klein. Ablative laser treatments require a longer recovery period. Nonablative lasers have less downtime following treatments, but you may need to undergo multiple treatment sessions—up to six—for the best results. Results may not be immediately obvious as non-ablative treatments tend to be more gradual in their improvements. According to Edward M. Zimmerman, MD, who runs Las Vegas Laser & Lipo, it may take up to a year to fully appreciate the results. Laser resurfacing can be quite effective at improving the appearance of acne scars. According to Dr. Klein, the treatment can be 40-100% effective, depending on the type of laser used. The degree of improvement can be significant, sometimes completely concealing all evidence of past scarring. “While not a perfect solution, the results can be positively life-changing and quite gratifying,” says Dr. Zimmerman. Some types of scars are more difficult to treat than others. For example, ice pick scars are very difficult to treat, while shallow rolling scars respond very well to laser resurfacing. Factors that predict response to treatment include skin type, overall health, compliance with good skin care routines, and the age of the scar. According to Dr. Lain, more recent scars respond better than older ones. Laser resurfacing is generally considered a safe procedure with minimal side effects. However, as with any treatment, it’s not 100% risk-free. Ablative lasers, particularly CO2, are associated with more side effects. The experience of the laser operator also plays a big role in determining the likelihood of experiencing negative side effects. Skin resurfacing is sometimes performed by people who lack the appropriate training for it. Always do some research and consider the qualifications and experience of the provider before undergoing the treatment. Incorrectly administered and overly aggressive laser treatment may result in scarring, burns, changing skin color, and worsening of existing skin conditions. Following treatment there may be mild to considerable pain, redness, and blistering. Infections are another possible side effect. The cost can be anywhere between $350 and $1,500 per treatment. The type of laser, geographic location, and experience of the provider all play a role in determining the final price. Generally regarded as a strictly cosmetic procedure, most health insurers will not cover the cost of treatment. Laser resurfacing is a very effective treatment modality for acne scars. The side effects are generally tolerable, and the psychological impact of a successful treatment makes it a very worthwhile procedure. However, your physician may instead recommend one of the following alternatives if he or she deems it more suitable to your specific skin type and concerns. Invasive; good for large scars. After scar removal, the defect is sutured. Depressed scars may benefit from a filler that is injected below them to raise the skin. Mechanical “sanding” of superficial layers of raised scars. May cause significant discomfort. Topical steroids can improve some scars, particularly hypertrophic scars. A minimally invasive procedure that creates microscopic wounds in the skin which stimulate collagen production. In this procedure, a raised scar is frozen then removed. » Find out more about your acne scar removal options by reaching out to expert cosmetic doctors in your area using Zwivel’s online consultation platform.